A Comfort Quilts workshop takes place at Brookhaven at Lexington, a retirement community. Jane Norberg, along with a large percentage of her friends, began quilting decades ago. At this point, many of them have just about run out of recipients for the colorful bedspreads and wall hangings. But the world always needs more quilts. 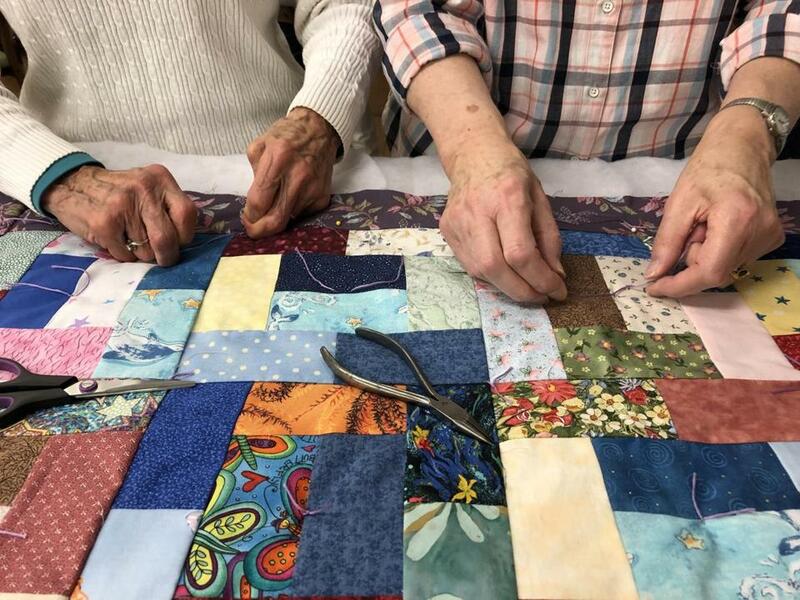 For the last 30 years, Norberg has led Comfort Quilts , a project in which local residents put their skilled hands to use making products to donate to those in need. In addition to bed-sized quilts, the volunteers stitch items such as lap quilts for patients in wheelchairs, teddy bears for police to give to traumatized children, and a recent addition: pet pillows for humane societies. The project donates hundreds of quilts each year, according to Norberg. She estimates the program has worked with 50 organizations and given well over 200 items since September. Norberg never says no to an organization that wants to receive quilts. The final products are created by a members of a hodge-podge of quilt guilds scattered across New England, from Rhode Island all the way up through New Hampshire. On any given day, Norberg, who is in her mid-70s, assembles bundles of kits containing all the material to make one quilt. She hands them out at various guild meetings or at one of the six quilting classes she teaches. Most of the fabric for the items comes from leftover stashes and scraps from area quilters. Norberg said her own fabric stockpile rivals that of many quilt shops. The project doesn’t just send quilt ingredients into the universe in hopes they return. It relies on large quilting events, which occur every few months. Attendance can reach into the triple digits, depending on the size of the event space. The gatherings are reunions as much as they are workshops. In addition, a handful of women, including Norberg, gather every other week in the basement of one woman’s Burlington residence to use her coveted long-arm machine. The contraption makes the work fly by much faster than if they stitched by hand. Despite the amount of work the quilters put in, they usually never know where their creations end up. However, even the small portion of letters, photos, and stories Norberg receives prove to her what a difference a small gift can make in someone’s life. One woman who received a quilt didn’t want to ruin it by using it, so she immediately called maintenance to come hang it up. She wanted it to be the first thing she saw when she woke up and the last thing she saw when she fell asleep, according to Norberg. Norberg also enthusiastically tells the story of a man undergoing chemotherapy whose culture did not permit him to receive a gift without giving one back. When his dinner tray came, the man offered his orange to the nurse so he could keep the quilt. Clare Dalton is one of the nurses who sees the direct impact of Comfort Quilts. She works in the adult oncology department at Tufts Medical Center. Each pillowcase and quilt she receives from Norberg is completely unique and brightens up the “institutionalized” atmosphere of a hospital room. Every time Dalton hands out another item, she feels the bond between her and her patients strengthen. The gifts help them realize someone is out there thinking of them, and not just because they have to. For some recipients, that means the world.